AUSTRALIAN criminals and terrorists will now be able to produce some of the world's deadliest firearms at home with the click of a mouse after the Trump Administration app­roved the online distribution of 3D printable gun plans. The Daily Telegraph was able to view schematics for an AR-15 semiautomatic rifle yesterday through the Defence Distributed website which has become legal in the US after reaching a settlement with the Justice Department last week. 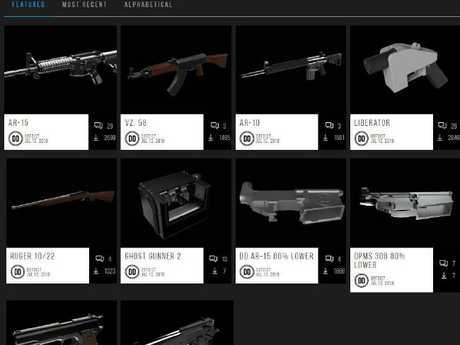 The website, which promises to usher in "the age of the downloadable gun", has posted schematics for dozens of firearms which can be built in backyard printing operations, including a Ruger 10/22 shotgun and an AR-10 rifle. Users pay a $5 monthly membership to access the schematics. The company was banned from posting gun schematics by the Obama Administration but that ban was overturned last week on the basis of the US Constitution's Second Amendment on the right to bear arms. International Cyber Policy Centre director Fergus Hanson warned it would be "impossible to put the genie back in the bottle" now the website was live. "In the age of VPNs (virtual private networks) where you can mask your location people will always be able to access this website," he said. "Now that it has the blessing of the most powerful country in the world it will be difficult to stop. "Once 3D printer technology becomes a household consumer item then criminals, teenagers and extremists will have access to these weapons." While accessing the plans is easier, possessing a blueprint to make a 3D replica guns remains illegal in NSW with a maximum penalty of 14 years jail. NSW Police said they were powerless to block the website but warned they would pursue anyone found with a schematic. Anarchist and gun lobbyist Cody Wilson, who owns the website, is being sued by 21 US states attempting to block its IP address. His staffer John Bartolo was photographed shaking President Donald Trump's hand in May in the lead-up to the settlement announcement.